vulnerabilities will dramatically increase. 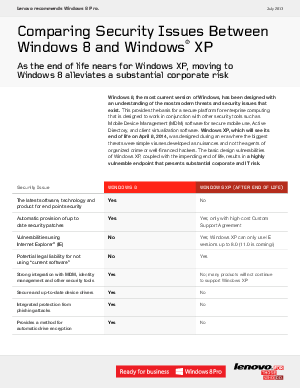 Companies with lots of Windows XP machines still in use need help upgrading in this compressed timeframe. Lenovo has an answer, as its Image Technology Center (ITC) services along with the Lenovo In-Place Migration (IPM) product can help internal IT staff quickly and successfully migrate from Windows XP to Windows 7 or Windows 8 with a minimum of disruption to users and the organization.